You'd expect the Talwar to be heavier considering that background, but the weight of this interesting pocket folding sword is only 7.6 ounces. The 3-3/4-inch blade, hollow ground from VG-1 San Mai III stainless steel, has a wickedly curved cutting edge and a false bevel along the spine. Like other Cold Steel inventions, it's obviously not meant for peaceful purposes. The heavy steel bolster and deep finger choils in the micarta slab handle are built for weapon retention instead of working leverage. Everything about this knife is more than it has to be for ordinary use. The other side of the Talwar involves too many perks, some of which will probably go wrong. The opening system, for example, depends on a thumb plate which can serve as the thumb stud in a more conventional one-handed deployment. Cold Steel expects users to snag the thumb plate on the seam of the pants pocket in a pocket sword version of a gunslinger's fast draw. I can imagine that working well sometimes. This critical thumb plate is removable, and many people will not like it. 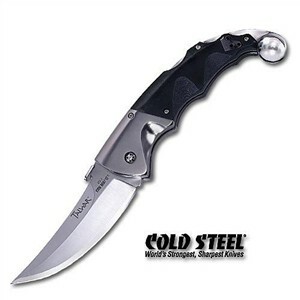 Locked open -- with what Cold Steel calls one of the best rocker locks in the industry -- this pocket clip knife extends to 9-1/2 inches. That surprising length includes the second main assault weapon in the Talwar's arsenal -- the stainless steel pommel. Securely mounted to the Talwar's titanium frame, this solid steel ball could actually break bones as well as car windows. Using it as a handle extension as Cold Steel suggests makes little sense. Despite a couple of wild ideas, the Talwar is a dependable knife in one of the most imaginative styles to emerge from Cold Steel's think tank.